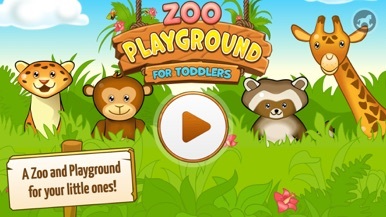 Zoo Playground - Animated Animals for Kids is an educational game perfect for your kids to become familiar with animals and exercise their logical skills. 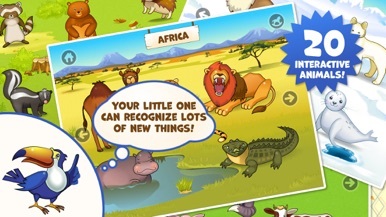 Navigate around the different screens and get to know the animals' names by tapping on them. 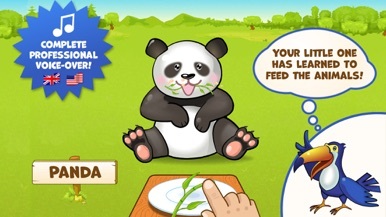 Watch the cute animations and try out the different games: in the first one, you'll get to train your memory in a simple matching puzzle and in the other available one, you'll need to drag each animal to its correspondent habitat. The best feature about Zoo Playground are the amazing graphics, which are perfectly smooth, colorful and engaging for children who love some interaction. Black Fox Studio is the developer of Zoo Playground - Animated Animals for Kids free version and full with 40 animals and 7 mini-games. Not original but great for children to discover new animals and their homes. “Zoo Playground”: an extensive Zoo and a fun Playground in one with lots of animated animals and built-in educational games. “Overall, this app manages to balance the provision of educational material with the engagement of young learners and manages both in one beautifully designed package that children will be keen to come back and learn from over again.“ – EAS Certification 5/5. At the Zoo, your little ones will meet lots of different animals. At the Playground, they’ll play many fun, engaging, educational mini-games. These games will enrich their knowledge, and help to develop various key skills. Children can feed the animals, pet them, learn their calls. The animals are colorful, friendly and fun – so that your child will be content to enjoy many happy hours of play and learn at the same time. – Feels happy and have lots of fun playing with all the amusing animals! 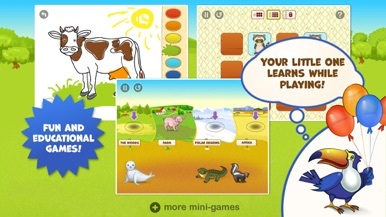 The current Free version of Zoo Playground comes with 3 built-in educational games and may be extended to full version with 9 games, each of which is specifically designed to develop various key skills. These key skills include: Memory, attention, cognitive ability, motor skills and imagination. 1. “Who lives where?” – a game designed to develop cognitive ability, memory and attention skills. The child matches the animals to their natural habitats. 2. “Coloring” – the child colors in different animals and learns color terms. 3. “Happy Memories” – turn over the squares and find matching pairs of animals. The number of squares increases with each successful game. 4. “Numbers” (New!) – a game designed to develop the child's numeracy skills. 5. “Words by letter” – the game shapes the child’s understanding of the alphabet and teaches them to recognize letters and words. 6. “Swapped habitats!” – a game designed to develop cognitive ability, memory and attention skills. A different version, where the object is to match the animals with their natural habitats. 7. “Feeding” – feed the animals by giving them the food you think they’ll like the most. 8. “Hide and Seek” – the task is to pick out the right image. The number of images increases. 9. “Jigsaw Puzzle” – your little one learns to distinguish different parts of an image and to assemble them into a complete picture. Play God and create the world by correctly combining various elements. Even the Almighty needs a cookbook. Play God in JoyBits Ltd.'s Doodle Kingdom - the easy part was conjuring the world, now what are you gonna put in it? Begin with the most basic of elements, like sea, sky, man, and beast. Combine then in your combine-o-matic and discover pairin…. A mix of management and RPG space exploration game. If there's something we have being enjoying in m-gaming since roughly a year ago is a rising of games that combine two or more genres. Evolution is one of those games, clearly divided into two different gameplays: there's a long, essential stage when you raise your space colony by building buildin….